Humans have always looked to the stars for inspiration. Once flight became possible, men and women risked their lives to push “higher, further, faster, more,” in the words of Captain Marvel/Carol Danvers, and her current writer, Kelly Sue DeConnick. The first arc of DeConnick’s Captain Marvel series was all about the women who were the inspirations for her desire to fly and touch the stars: the female pilots of World War II. 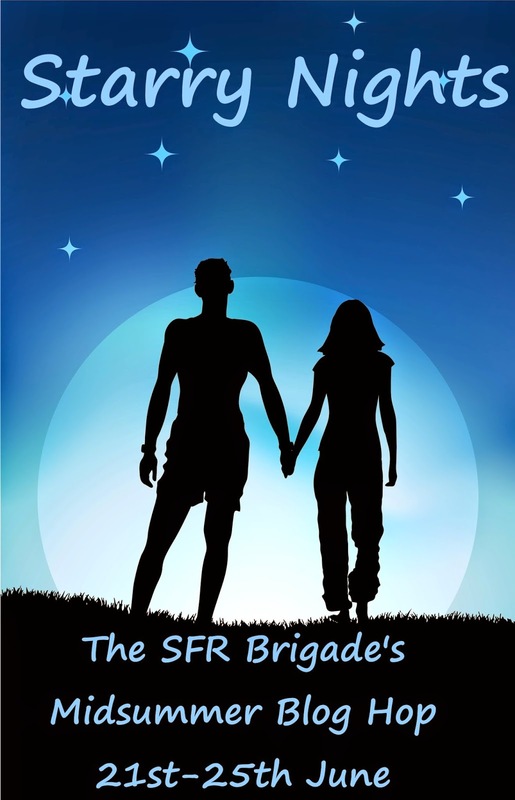 So it seemed appropriate for my post for the “Starry Nights” theme of the annual Science Fiction Romance Brigade Midsummer Blog Hop to focus on those women, real and fictional, who looked at the sky and dreamed big, impossible dreams. Note: if you’re dreaming of some swag, please check out the rafflecopter entry form below. Some seriously good stuff there, including Amazon/B&N gift cards of up to $100. There were, of course, the early female pioneers of aviation, like Jackie Cochran, Amelia Earhart and Bessie Coleman, the first African-American women to gain a pilot’s license, even if she had to go to France to do it. In a terrific book, Amelia Earhart’s Daughters, the history of the second generation of female flyers is detailed, including many who tried out for the Mercury astronaut program, even though they never really had a chance to be accepted. And there are my favorite fictional women who dream big, like my Joan Krieger, the heroine of my Curse of the Brimstone Contract, who never liked going in the side door and is so determined to rule her own fate that she’ll end up changing society, rather than let society change her. Cordelia Naismith of Lois McMaster Bujold’s interstellar Vorkosigan series is one of my favorite characters ever, a force of nature with compassion that knows no bounds. Cordelia frequently expects those around her to search for solutions that seem impossible. To me, the stars and the sky above represent our dreams, the ones where we hope beyond reason. They represent the heroines of science fiction romance who take a leap of faith in themselves and the person they love and are rewarded with happy endings that are all the more joyful because of that. As part of the Starry Night Blog Hop, we’re giving away STUFF. MUCH STUFF. 7/7 NOTE; Winner has been notified. Note: I’m having trouble with wordpress accepting comments. 🙁 If you’ve tried to log on and enter previously, I apologize. I’ve kept track of two entries sent via the newsletter and we’re switching over to Facebook likes. If that’s a problem, just hit the newsletter button to enter the contest. And thanks for your patience.